Last week at my markets I got some interesting requests from customers. Here they are. 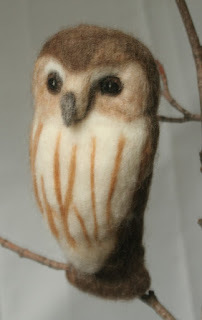 This is a saw-whet owl, one of the smallest owls, requested by a group of women for a colleague who is retiring. 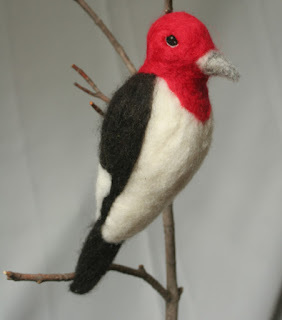 Here's a red-headed woodpecker. He's different from the red-bellied woodpecker, who has less red on the head, and a black and white striped back. 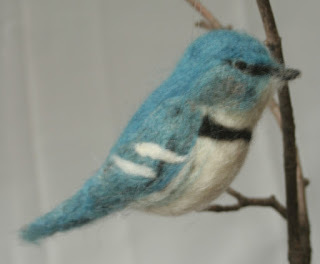 And this is the cerulean warbler, requested by a woman whose daughter has been researching ceruleans. Now that I've got these made, I plan to work on some chipmunks and cardinals, and my new green man. It's so fun to have creative work! Oh what lovely birds! They are incredible! I especially love the woodpecker.